It's the "E" in STEM, but what is engineering education, really, at the K-12 level? A series of discussions on The Opportunity Equation blog tackles that subject thoughtfully through conversations with engineering experts and educators. Recently, Christine M. Cunningham, the Founder and Director of Engineering is Elementary (EiE) -- a program of Boston's Museum of Science -- weighed in on the work that her organization does to engage students of diverse backgrounds and interests in the wonderful world of engineering. After seven years of research and testing, EiE has evolved into a 20-unit engineering curriculum for elementary schools. Somerville High School Physics Teacher Michael Maloney Wins Cubist Educator of the Week! Michael Maloney, Assistant Director of the Massachusetts Region IV Science Fair, received "Educator of the Week" honors at the Sunday, September 30 Patriots football game through Cubist Pharmaceuticals’ Science Education Leadership Award program. According to Somerville High School Assistant Principal Sebastian LaGambina, who nominated Mike for the honor, "Michael is an absolutely fabulous physics teacher... probably the best educator I've seen in almost 30 years of education." Developing an ePortfolio template that will be implemented school-wide, in which all 1,300 students will have an electronic portfolio for displaying their best work. Science scored a touchdown at the Patriots game last night, when Kelly Graveson, an 8th-grade teacher at Douglas High School in Douglas, MA, earned "Teacher of the Week" honors through Cubist Pharmaceuticals’ Science Education Leadership Award program. Throughout football season, the program will honor science teachers in middle and high schools throughout New England who are incorporating innovative techniques in the classroom that inspire and engage students in the world of science. Marlborough High School will welcome a VIP tomorrow, when Massachusetts Secretary of Education Paul Reville will pay a visit. The focus of his visit will be the high school's STEM Early College High School, which integrates project-based learning experiences and personalized portfolio assessment with community involvement and internships in STEM-related careers. Funded in part with Race to the Top money, the program supports closing achievement gaps, and has received praise from Gov. Deval Patrick. Scientific American and ScienceDebate.org (which refers to itself as "an independent citizens' initiative asking candidates for office to discuss the top science questions facing America) posed 14 questions about science and education to President Obama and Republican presidential candidate Mitt Romney. Their responses will be analyzed and graded in the November issue of Scientific American, available next month. In the meantime, you can read what the candidates had to say on such subjects as education, climate change, biosecurity, and innovation on Scientific American online. Broadcom Foundation Executive Director Paula Golden received a "high-five" voicemail from astronaut and STEM champion Sally Ride just weeks before Ride's untimely death from pancreatic cancer: "Paula, this is Sally Ride. I clipped an article you wrote about the importance of motivating kids to study math and science in middle school and called to let you know that the Broadcom Foundation is on target with support for training teachers in STEM project-based learning." On a recent post in her blog, Shaping Youth founder Amy Jussel shares her impressions of a couple of STEM-centric toys showcased at the Maker Faire. Specifically, littleBits grabbed -- and held -- the interest of young kids. LittleBits (dubbed "LEGOs for the iPad generation") enable children to create working circuits without soldering, programming, or wiring. Using the components and buildables, including dimmer, buzzer, light sensor, etc), kids can create almost anything they can imagine. Massachusetts Students Make Broadcom MASTERS Finals! Two of the 30 U.S. students in the final round of the Broadcom MASTERS (Math, Applied Science, Technology and Engineering for Rising Stars) competition finals hail from Massachusetts. Daniel Lu of Carlisle, MA will compete in the finals with his project, "Psychoacoustics: The Perception of Volume." Assonet's Ethan Messier will present "Wave To The Future (The Utilization of Marine Waves Using Wave Buoys to Generate Electricity)." A program of Society for Science & the Public (SSP), Broadcom MASTERS is a leading science, technology, engineering and math (STEM) competition for middle school students. Randolph-Macon College English Professor Thomas Peyser makes an interesting case for the importance of STEM students having a strong foundation in grammar in the Richmond Times-Dispatch. "...we can be confident that the abandonment of instruction in grammar is robbing us not just of future writers but of future scientists, physicians and engineers as well," he writes. With more and more emphasis on STEM education and less and less on grammar, the gap seems to be widening dangerously. Scientists use words, sentences, and paragraphs to communicate, just as writers do. Furthermore, STEM studies require students to distill complex sentences for comprehension. 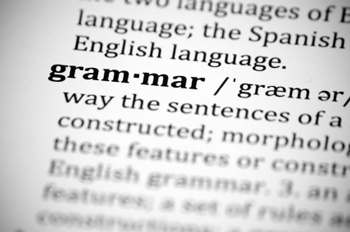 Without an ample grasp on the fundamentals of grammar, students find themselves at a disadvantage on both the expressive and receptive sides of the communication equation.